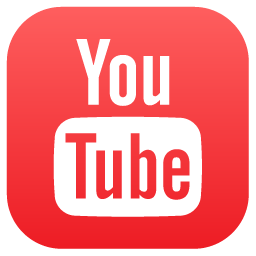 Categories: All Americans, Best Sellers. 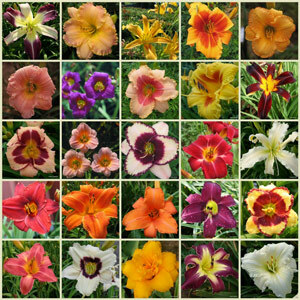 A 2002 All-American Daylily Selection. One of the longest blooming varieties we’ve grown. 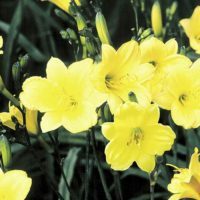 Petite 2″ blooms appear very early in the season above grassy foliage, and it reblooms so well you would think the rebloom was its first bloom cycle. Just wanted to mention, that while other reviews say Bitsy runs shorter … the scapes on mine were 28″ without any spring fertilizer. 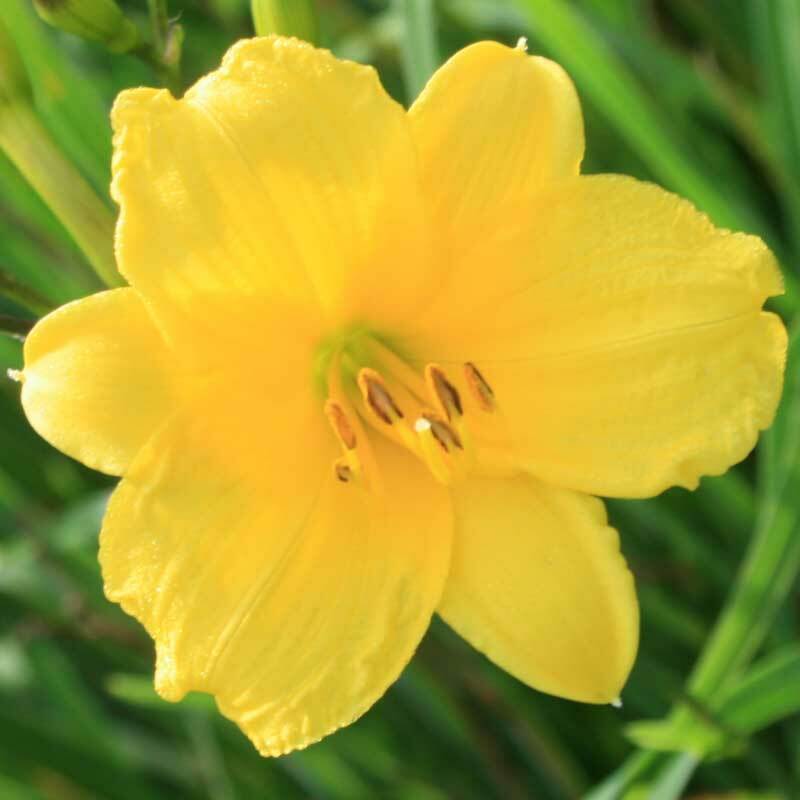 I planted it in the front of the garden, expecting a shorter daylily, and when it bloomed at 28″ it was still perfect with its sparkling little blooms floating above shorter plants. 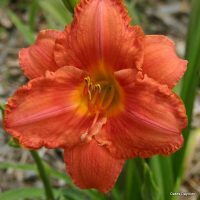 Because the blooms are smaller, and the foliage is short and delicate, it did not overwhelm the front of the border … And blooming weeks earlier than other daylilies, I was glad to have it up close to enjoy. A little treasure!! Incredible!!! Planted just a year ago, Bitsy has been blooming for 3 weeks and has 48 more buds!! Here in Maine, June is extremely early for day lilies, and Happy Returns (which is supposed to be extra early) hasn’t even begun to bloom yet. *Bitsy* is a cheerful, bright little trooper … Can’t believe the length of bloom time, and number of blooms!!!! Now one of my favorites! I purchased Bitsy this spring and have been enjoying it’s dainty little cherry blooms for several weeks now. The plants are grass-like and so far the scapes haven’t topped 12 inches (which may simply be due to being its first year). For some reason I mistook this for a taller cultivar and planted it on the backside of a bed which I’ll look at correcting in the early fall. 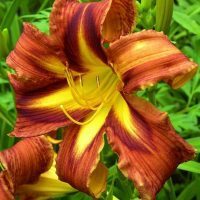 Other than this mistake on my part it’s a beautiful little daylily that would be perfect along the front of a bed or lining a sidewalk. This may be my all time favorite daylily. While the color may not be all that eye-catching, I personally love the clear, lemon yellow color. Best yet, it is almost always in bloom! I also like the very green, grass-like foliage – the plant looks good even on the rare occasion it is not blooming. 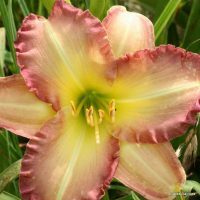 This is just a great daylily – much, much better than Stella which I don’t particularly care for. Corry, P.A. 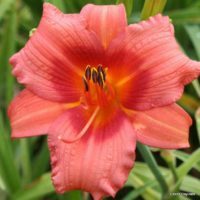 – I was shocked at how fast this daylily got adjusted to where i planted it last fall and sent up 3 scapes with plenty of flowers on it! It’s a must have if you like daylilys such as happy returns that are short to the ground and bloom a lot. Bitsy bloomed the first year it was planted. It is a pretty lemon yellow. Bitsy is an unassuming little jewel. Beautiful little perfect flowers on fairly tall scapes. Planted in July in partial shade and it bloomed in about 3 weeks. It is still blooming one at a time, but that’s not bad for the first yr. Did I mention how generous and healthy all of the daylily clumps were that I ordered? Even my husband was impressed. This little beauty blooms and reblooms and then reblooms again. In my collection, it’s far and away the earliest to flower, and then it’s far and away the latest to still be blooming. The flowers are really small – hence the name – and the plant is very delicate looking. When I first planted this one, I split up the huge fan I received and spread the plants around in the garden. Since the plants and the flowers are so small, I think it would have been better to mass them all together. Next time I have to divide up the daylily bed, I’ll correct that mistake and move all the Bitsy’s together. Absolutely spectacular! I planted 4 fans on March 5, 2011; the first blooms were on April 11, and to date (May 16, 2011) we ahve had 132 flowers with some yet to come. These are beautiful miniatures that liven up our fron planter – a must have for sure. This is my 15th Anniversary with “Bitsy.” I had not a bud Year 1; I bought 1 “Bitsy” as a trial, and it seemed to disappear Year 2. Year 3 was the microburst that shaved everything off at ground level. I was going to can it – but saw the shoots coming up. Today I have a dozen mature plants in that area – all from that one struggling plant. And the dark green stems with the purest of yellow is just sooooo beautiful and calming. It has been blooming in my garden since late April (strange weather). Definitely the longest bloomer I have, ..and a 10! Nice little flower on tall scapes,best rebloomer.Better all around plant than stella if you are looking for a small rebloomer. Bitsy looks good in a cottage garden because of the branching. The color is a true lemon yellow and the leaves are thin. Bitsy is so cute and so prolific! I received it last spring (2008) and although it grew lots of leaves, it did not bloom that spring or summer. It tried in October, but got hit with winter weather before the buds opened. This spring it came on very early with the first flowers opening on May 15th! It is very striking looking even though it is a small flower because the stems are so dark, almost wine colored! Love it! I got my Bitsy’s in September, one had a bud on it and bloomed in October. Now it’s January and all three have bloomed and the first one is still blooming… I want more! Bitsy was a bonus plant, received with my fall order. 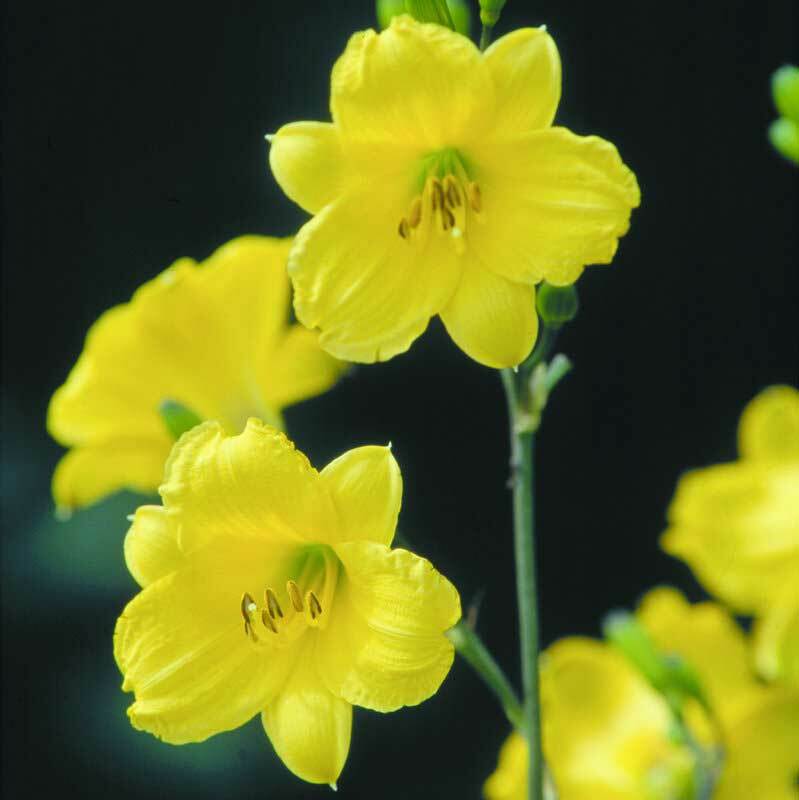 Since I did not have the ideal spot in the bed for such a small plant, I put it into a medium sized pot and set it on a large rock, nestled among some larger daylilies. Of course Bitsy was the first daylily to bloom this spring with many brightly colored sunbrusts of blooms; so welcome. Am expecting more with the rebloom. Bitsy is a very rewarding little daylily. Perfect for the border! Blooms reliably from early May into October here in middle Tennessee. I can’t imagine being without little ‘Bitsy’. Of all my many daylilies, this one is the first to bloom this season—April 29, 2005! 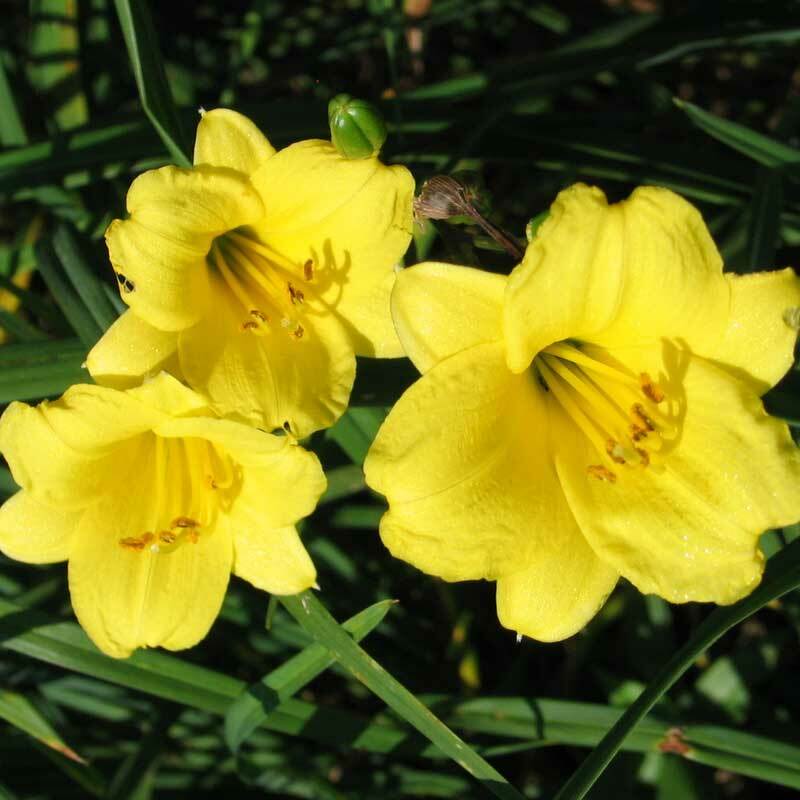 I recieved and planted these daylilies mid-September the week before Hurricane Ivan hit our region. They started blooming almost immediately and still had blooms on them at Christmas when sleet stopped them. They were so bright in an otherwise ravaged landscape. Can’t wait to see what they do this spring! I love this daylily. 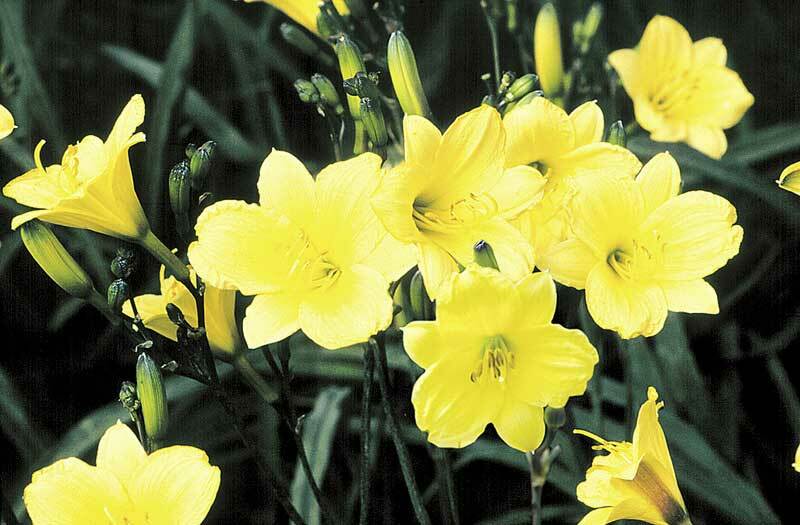 The blooms on mine were more golden than lemon, which goes beautifully with the black buds, stems and scapes. This variety is always the first of my daylilies to bloom. I love the branching of this variety because it is so graceful. The cheerful yellow blooms always annouce May is finally here. It is a joy to grow! For the sheer joy of yellow, plant one of these.